I didn't set out to blog this recipe. I mean, I just didn't think bunging a rack of ribs in the slow-cooker and mixing up a few bottled barbecue sauces would be that good or interesting. I thought it would be a pretty ho-hum meal... How wrong could I be?... majorly, as it turns out. This started out as a hurried Sunday night family meal. (I know that's counter-intuitive, given it's a slow-cooked recipe, but bare with me). It was just meant to be a casual, no-frills affair for my ravenous dudes who had been out all weekend. Certainly not blog-worthy. I had a rack of ribs, I had some bottled sauces and barley enough time. (These should be cooked for at least 6 hours, I just made it to 5 hours - they were still, melt-in-the-mouth... like butter, people, butter!) So I raced around for 20 minutes... making the rub... making the sauce... prepping the ribs. Sweating and puffing, I turned the slow-cooker to low and forgot about them. My camera stayed in it's bag. I didn't take any "process" photos along the way. No shots of rubbed ribs, no half-cooked racks, no glossy sauce... nada. 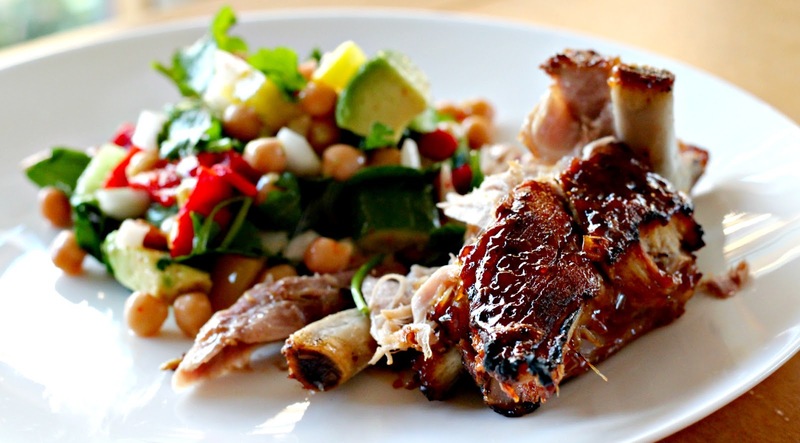 Slow cooked ribs, straight from the slow-cooker are pretty unattractive. They're a little pallid and anemic looking. So, still no thoughts of a blog entry. I innocently anointed the ribs with their coating of barbecue sauce and whacked them under the grill (broiler). My family were well and truly ready for their meal and setting the table, when I pulled this lacquered work of art out from underneath the grill (broiler). I immediately ran to get my camera at the first sight of it. My family all sighed and rolled their eyes. They were salivating and their bellies were rumbling while I told them not to touch it, positioning the tray this way and that to get my shots. When I looked up they were seated at the table with their knives and forks in their fists - I thought I was going the start hearing the chant "We-Want-Food. We-Want-Food." Once these shots were taken, that rack of ribs didn't stand a chance... imagine a cave family. A rack of ribs to serve 4 - mine weighed 1.5kg. 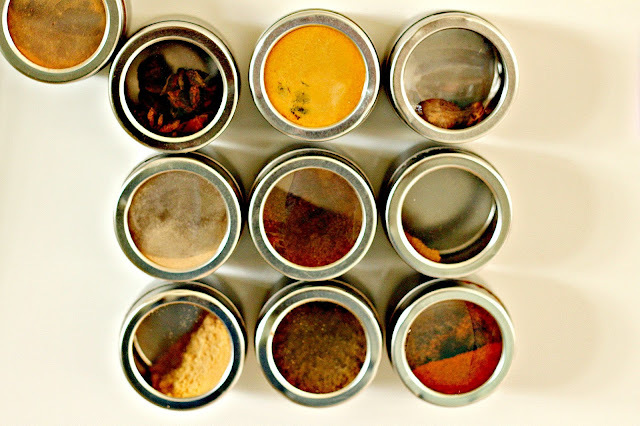 Put all the ingredients into a spice grinder (I use a dedicated coffee grinder), and blitz until fine. If you have time, rub the ribs with the rib rub (oh boy, that's a mouthful), the night before you want to cook them. I wasn't organised enough for this, so I basically put the rub on then stuck them in the slow-cooker. They were fantastic any way, but next time I'll try to apply the rub in advanced and see if it makes a difference. 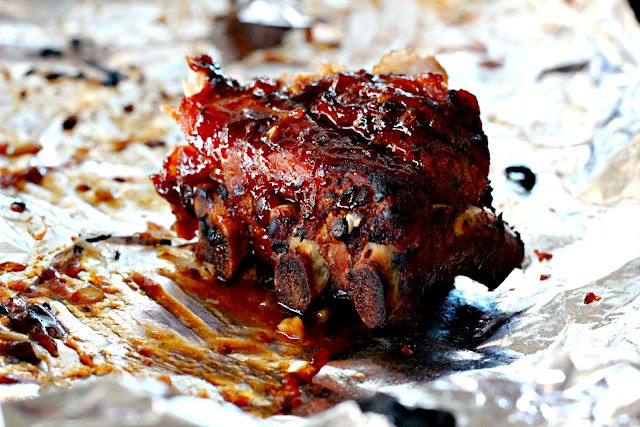 Stand the ribs up on their sides with the meaty sides facing the walls of the slow cooker. You don't have to put anything else in with them at this point. Cook them on low for a total of about 6 or 7 hours but after about 3 or 4 hours, add 3/4 of your barbecue sauce, trying to coat the ribs with it as much as you can ( I used disposable gloves. 'cause those suckers were Hot!). Continue to cook until it has been a total of at least 6 hours and up to 8 hours. If you can't do the halfway thing add the sauce from the get go. 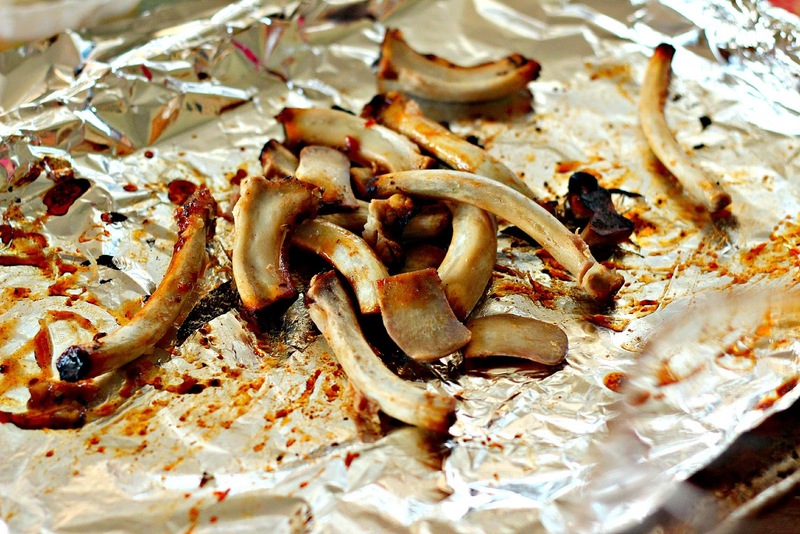 When they are done, remove the ribs carefully (they will be very well cooked and want to fall apart) and set them on a rack over a baking tray (you might want to line the tray with tin foil to catch the drippings) and set aside until you are ready to finish them right before you are going to eat them. Preheat your grill (broiler) with the rack about 20cm below the element. 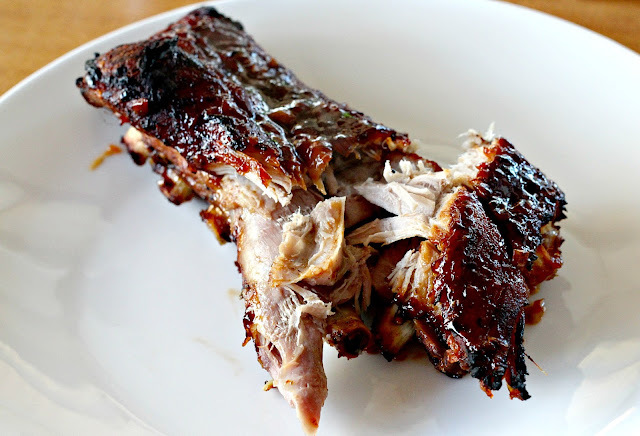 Brush your ribs with the reserved barbecue sauce and grill for about 4 or 5 minutes. Brush more sauce on them and grill for another 4 or 5 minutes. Continue to do this until they reach your desired level of caramelization. If you have any left over barbecue sauce, take it to the table to serve with. I love the way you make me laugh in the morning. I'm trying to eat my breakfast, stop that!! :P Aww sometimes, the recipe that we think will be just normal, turns out to be so nice that we're blown away!! I don't make ribs enough. I sould do that sooonnn!!! You do know how completely unfair this is...you give me a hint of some super salad/salsa stuff, and then bam...you just leave me hanging! Sooo nnnottt faaaiiiirrr!~ Did you get the winey voice?? 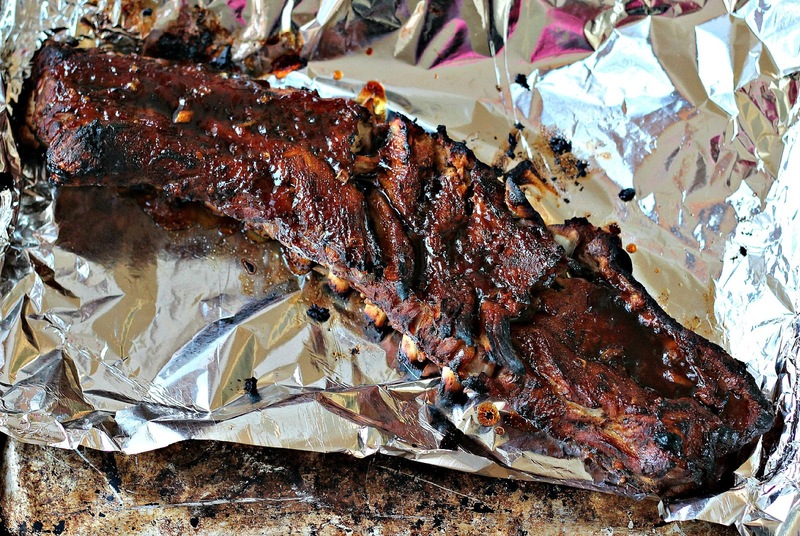 ;)And oh yes, the ribs look spectacular!! I haven't had good ribs in a while, suppose it's time! Those ribs look so appetizing! Saw this photo today on FoodGawker. Throw it all into a salad bowl and toss with salt, pepper, a BIG squeeze of lime and a drizzle of olive oil - enough to coat. Hey mamashack. Thanks for your comment. I totally agree. I've come to the conclusion that slow-cookers must have been created for the sole purpose of cooking ribs. The person who invented the slow-cooker must have had ribs on the brain. Whoever he/she was, was a genius with very strange anatomy. lol! Hey Leah. Make these and have them for breakfast. they have coffee in them, that makes them a breakfast cookie, right? And don't worry Leah - just like Arnie "I'll be back". Salad and barbecue! Wow! I've been thinking about what to have for dinner later. Now, I have a very clear idea!